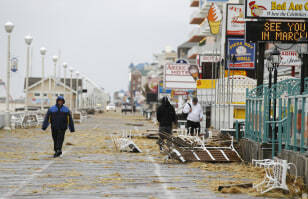 Residents walk by debris on the boardwalk after Hurricane Sandy in Ocean City, Md. October 30, 2012. Millions of people across the eastern U.S. awoke to scenes of destruction wrought by monster storm Sandy, which knocked out power to huge swathes of the densely populated region.